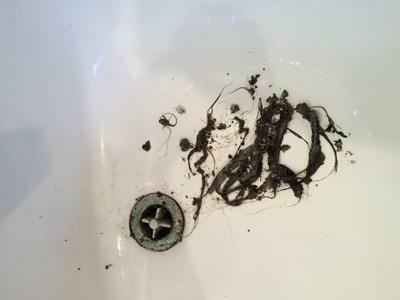 This sink wouldn't drain until Pulled out all that hair. Yuck! Great website! Cute and informative. Thought I would throw my 20 cents in too. I clean houses for a living and I have found an easy way to clean gross toilets. I always spray the underside of the seat with bleach, scrub the bowl with cleanser. Sometimes the outside is just as gross! In these cases I take a really wet rag and "rinse" the toilet off. As long as the excess water isn't going to cause harm to flooring or baseboard. Then I just dry with a clean cloth, and all the hair and gunk can be wiped up easily from around toilet. I need to get down there to wipe of baseboards and water house anyhow- now it's done all at once. A cup of water can be used as well to rinse off pesky hairs and "ick" off of a grimy toilet. One other trick is to designate a set of tweezers for pulling hair out of drains. Your clients will love the money they save on plumbers. Join in and write your own page! It's easy to do. How? Simply click here to return to Bathroom Cleaning Tips.